Looking for franklin library books? Biblio.com.au hosts hundreds of of the finest online book stores and booksellers, including specialists in franklin library. Use the list below to locate a specific specialist bookseller or book store near you. Or, use the form below to search the inventory of all booksellers who specialize in franklin library. 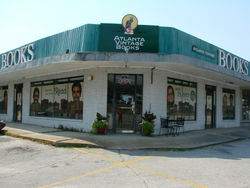 Welcome to Atlanta Vintage Books, serving book lovers locally and worldwide for over 20 years. Our 5,000 square foot book store houses over 70,000 vintage, rare and out of print books. You'll be greeted with a smile when you enter but left alone as you browse. Our staff is friendly, helpful and knowledgeable. Special orders are happily accommodated, as hard-to-find and out-of-print editions are a specialty. Our store is light and airy with plate glass windows letting in plenty of natural light and wonderfully decorated with antique display cases, old barrister bookcases, and wood book shelves. The wide aisles and scattered seating make browsing a joy. You'll wonder where the time went. Established in 2008, we are based in the UK but ship worldwide. We stock many signed first editions and some rare titles. Customer satisfaction is our highest priority. All items are securely packaged and promptly dispatched. In the case of actual shipping costs being less than the amount paid by the customer, the difference will be refunded. A large collection of modern first editions--most signed--as well as a large assortment of early Western fiction, Limited Edition Club, History and Biography. StuffCenter is also my eBay handle. I have been selling STUFF for friends and family since 2000. When a retired Dr friend of mine approached me and asked if I would help him sell his entire medical library (and then some), I looked around and found Biblio! Great resource! I hope to serve this community with the same integrity.